Mark Mooney poses for a portrait during his tenure at ABC News. Mark Mooney, a veteran New York reporter, editor and author whose cool head, easy charm and love of the craft made him a revered mentor in numerous newsrooms, died Oct. 6 of complications from prostate cancer. He was 66. Mooney’s news career stretched from the age of typewriter ribbons to Twitter, and he worked for a variety of outlets, including the United Press International wire service, The New York Post, the New York Daily News, ABC News and CNNMoney. By the end of his run in the trade, he had served as war correspondent, a New York City Hall bureau chief and a national editor and had covered news beats ranging from education to prisons. He edited thousands of new stories over four decades. 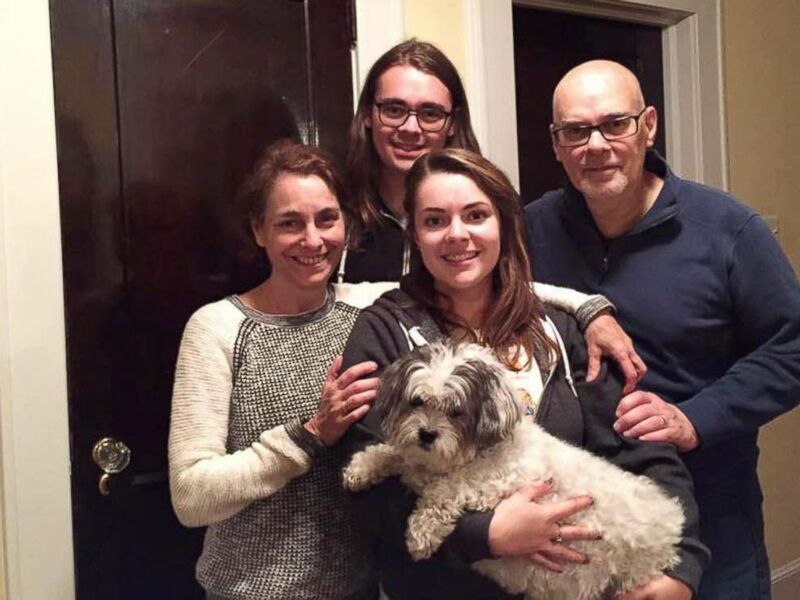 Mark Mooney with wife Barbara Goldberg and kids Maura and Paul. Mooney wrote his own obituary, “My last byline,” which was published by his wife on the day of his death. “I’m sure you’ve heard the old saw that you’ll never hear a dying man say that he wished he had spent more time at the office,” it began. “But if I were still here I would tell you that I wish I had done more work as a news reporter. Written better stories. Made more and better contacts. Skipped some of the easier pieces and done more in-depth stories. Spent more time on foreign stories. Been a better editor. 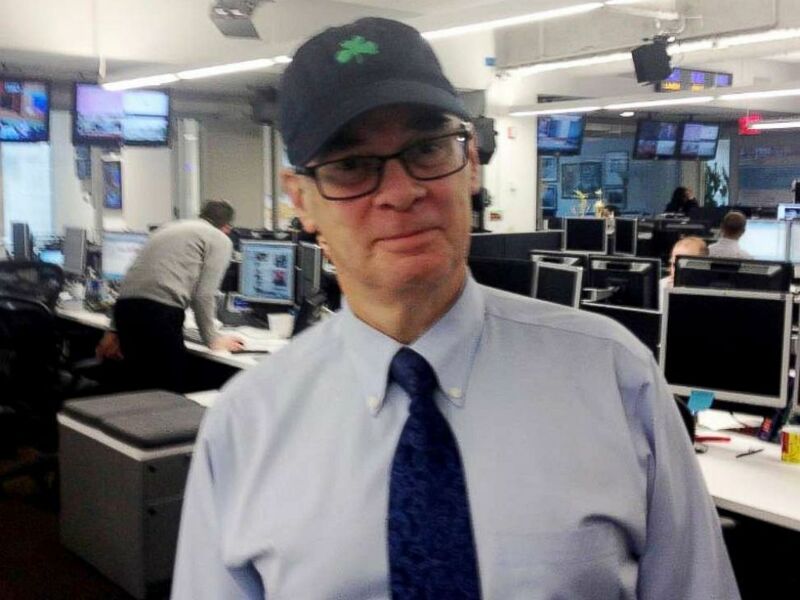 ABC News editor Mark Mooney pictured in the New York digital newsroom, Oct. 2013. Widely remembered as a thoughtful editor with a deft touch for the language of news, Mooney was liked and admired by both the old guard New York City print veterans with whom he grew up and Snapchatting millennials. His proteges include now Washington Post Baghdad bureau chief Tamer El-Ghobashy, who recalled in a recent email to Mooney how the older man had sent the young reporter on his first overseas assignment for the New York Daily News. At ABC News, Mooney was an influential mentor to scores of younger journalists. “I can’t imagine [a newsroom] without Mooney — barking out orders and commentary, swaggering over to reporters’ row for another round of boot-camp editing, an act of bravado, toughness … and great affection,” former ABC News editor Nancy Ramsey said. Former ABCNews.com business reporter Susanna Kim said Mooney never let a story that could be better slip through his fingers. 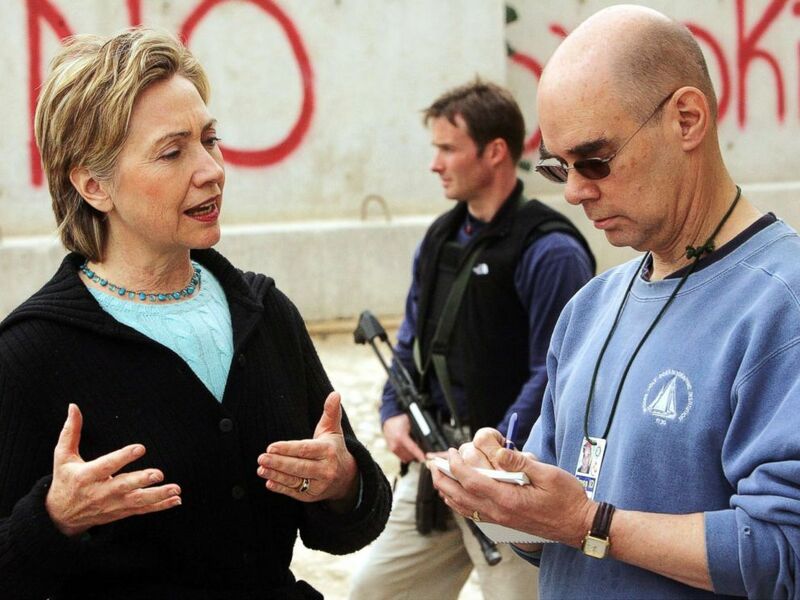 Sen. Hillary Clinton talks with Daily News National Editor Mark Mooney at Camp Fallujah, a Marine base outside of Fallujah, Iraq, Feb. 20, 2005. Mooney wrote nearly until his death last week, penning his modest, 478-word obituary as the coda to a yearlong blog about his cancer. Mooney reported on his impending death with blunt, unsentimental humor, and in his final months he pecked out short, clever, heartbreaking blog posts with headlines that aimed to leaven the brutality of the encroaching disease — “You can leave the oxygen tank next to the firecrackers” and “Cancer complaints interrupted by a great story” — about his last, packed-house reading from “Three Cents a Mile,” his recent memoir of hitchhiking across Southeast Asia and Europe in his 20s. The posts grew graver with time: “I am breathing, I am safe,” about his terrifying bouts with breathlessness, his decision to end chemotherapy and a moving love letter to his wife and primary caregiver, Barbara Goldberg, a Thomson Reuters national correspondent based in New York. As the cancer progressed, his blog following grew. 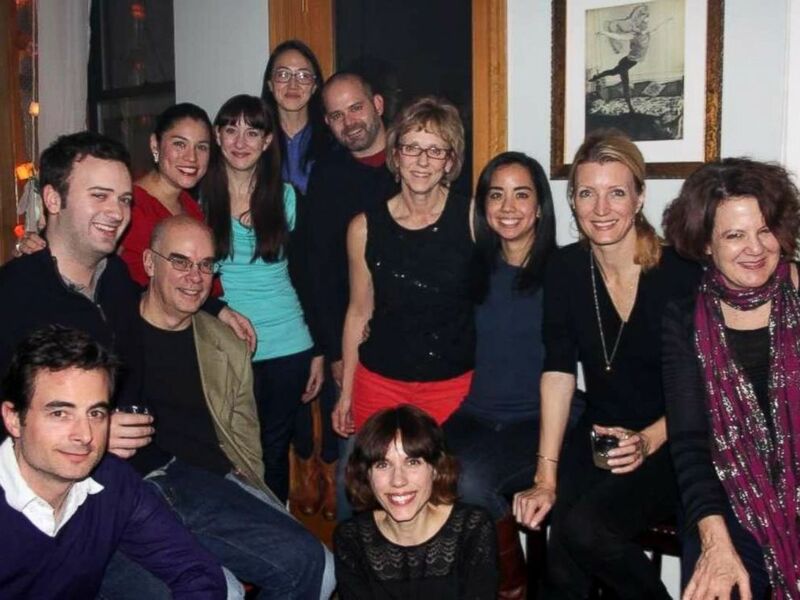 A group of the ABCNews.com team gathers for a holiday celebration in Dec. 2012. He was dazzled by Paris. For a few months in his 20s, he lived in the second-floor writer’s room above the Shakespeare & Company bookstore in Paris and opened the shop in the morning while the owner slept in. Mooney reported for United Press International in the early 1980s and served as the wire service’s New York City Hall bureau chief. 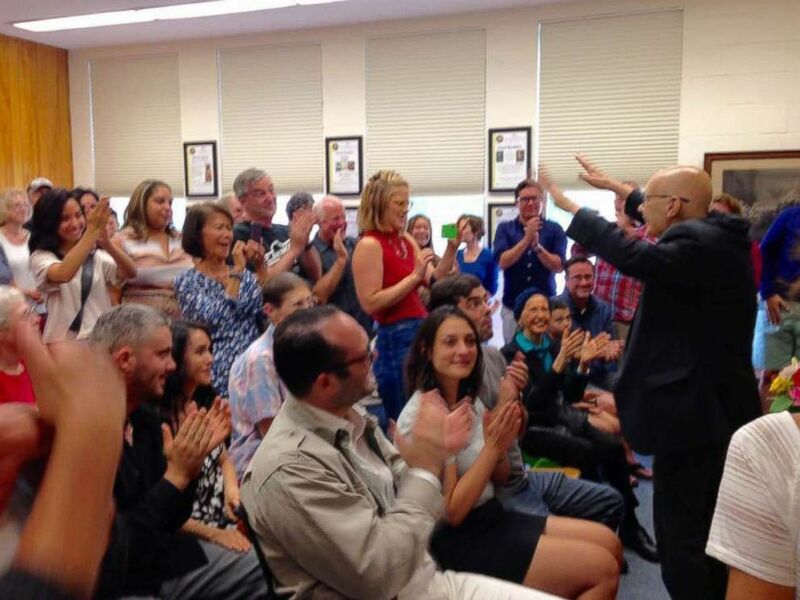 Mark Mooney gets a standing ovation from a packed house at his last public reading of his memoir, "Three Cents a Mile," July 30, 2017. In 1986 he moved to The New York Post, which early on sent him abroad with assignments that included covering the first Gulf War, a coup in Haiti and the assassination of then–Israeli Prime Minister Yitzhak Rabin. “Mark was a reason to love hanging out in the old Post newsroom — with those eyes that literally twinkled at the absurdity of it all,” Post reporter Cathy Burke said. In 1991, Mooney headed to The New York Daily News, where he was appointed national editor in 2000. He also covered a variety of beats, including health and hospitals, prisons, emergency services and City Hall politics. He was named the paper’s national editor in 2000 and held that position for seven years before his departure. In 2007 he was appointed national editor at ABCNews.com, where he managed breaking news stories and ran the website’s U.S. and international coverage. He also mentored scores of young reporters, many of whom arrived at the network with little or no formal training in print reporting. “He taught me that even on your worst day, be grateful that you get to tell stories for a living,” former colleague Katie Morison, now an MSN news editor, said. Former colleague Nikki Batiste, now a CBS News correspondent, said Mooney was her digital counterpart at ABC for the Amanda Knox murder case in Perugia, Italy, and the two of them grew close over the seven years they worked together. In late 2011, Mooney embraced social media. “I helped him set up his Twitter account,” ABC News producer Christina Ng said. “He was so excited about it, and we were in constant competition for followers." When Mooney hit his mark, he took newsroom reporters out for drinks at a dive bar near ABC News’ headquarters in Manhattan. “I remember how giddy he was — Jameson [whiskey] in hand – celebrating his Twitter milestone,” former ABCNews.com reporter Alyssa Newcomb, now a technology reporter at NBC News, said. In the end, social media served Mooney well. Ng said it was gratifying to watch “My last byline” spread online last Friday.